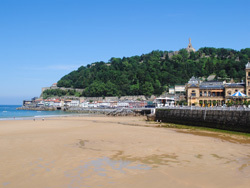 San Sebastian is known worldwide for it’s Michelin star restaurants (try Mugaritz and Arzak). It is also famous for it’s specifically basque take on tapas, called Pintxos. For the past couple of months, I have been suggesting to guests at my workplace that they go and catch the views over San Sebastian at the top of either Monte Igeldo or Monte Urgull. I finally got the chance to go and do this myself and I’m pleased to report that they did not disappoint! So far I’ve been in San Sebastian for a little over one month. As mentioned in my intro I am here with Apple Languages to focus on pushing my Spanish language skills to the next level! Whilst I’m here I will be exploring the city and letting you in on what it’s really like to live and study Spanish in San Sebastian! I jump into the kitchen and shout to my housemates ‘San Sebastian what do you think of? !’ and their first response is ‘surfistas!’…and they’re exactly right…the surfers are what this beautiful city is famous for. To all the yogis out there who love to travel and nourish their spirit by indulging in something new, this might be an interesting read for you! The ancient yogis taught us to nurture not just our bodies but also our brains by constantly learning. As a practitioner of yoga I love to discover new things, broaden my knowledge, and learn something new – and not just through yoga! Whether you’re an old-hat when it comes to the ancient art or have never tried it in your life, we’ve got some great Language & Yoga courses that will help you get the most out of your stay. Good food and good Surf in San Sebastian! What can I say about San Sebastian- it’s simply amazing! 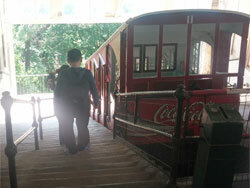 I loved its diversity, and the beach and old town, with beauty and traditional Spanish cultured mixed into one. The beach is surrounded by stunning green hills which give it a fantastically picturesque backdrop. Then all this is accompanied by great weather – perfect for my surfing class! 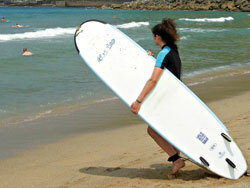 – Simply AWESOME – I’ve never surfed before, but after San Sebastian I’d recommend anyone to have a go. It’s really GREAT fun!!. 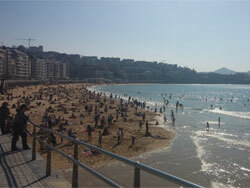 I had an excellent time in San Sebastian. There were incredible local dishes and drinks to try, and markets full of local specialties and Basque goods. I was able to walk to either the beach or the old town center from the school, it was perfect! 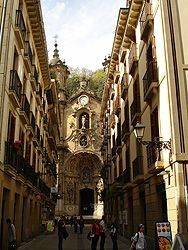 The thing I loved about San Sebastian is the diversity of the city – historic centre, modern areas, parks scattered throughout, beaches, stunning architecture, rich heritage, beautiful scenery, the list goes on and on … I have a soft spot for the old town. I spent a lot of time meandering along the narrow streets browsing in the shops and admiring the architecture. I loved the way you turn a corner and stumble upon a stunning church hidden away amidst the streets. You definitely have to try pintxos (tapas) in one of the many restaurants – you really are spoilt for choice and as you walk past the restaurants you can see the pinxtos laid out in the bar making the decision of where to eat even harder. The school also organises a Pintxos cooking lesson which is a lot of fun, and just one of many activities they organise.